House flipping is my primary business, although I am also a real estate broker, blogger, and landlord. I flip from 20 to 30 houses per year, and there is no way I could do that without great financing. Many people ask me why I do not just pay cash for all of my flips. The answer is simple: I make much more money using financing because I can flip three times as many houses as I can using just cash. I would make much more money on one flip using cash, but I am not interested in doing just one flip. In this article, I talk about the numerous ways you can finance house flips using banks, private lenders, hard money, partners, crowdfunding, and even owner-occupant loans (legally of course). Can you flip a house with a conventional loan? Finding financing for owner-occupied homes or even long-term rental properties is not very difficult. Banks like to finance properties that will be held for many years. They also like to lend to owner-occupied buyers because they think owner occupied-buyers are willing to tough out the bad times and because the government insures many owner-occupied loans. Banks do not like short-term loans because they make money on the interest paid on loans and stop making money as soon as a loan is paid off. Most house flips are sold less than a year after they are purchased. Most long-term loans can be paid off before the term is up. Most loans have a 30-year or a 15-year term. While the loans can be paid off early, banks do not like to see them paid off in less than a year. You may be able to get a long term loan on a flip, but when you pay it off and the bank sees you paid off the loan very quickly, they will be hesitant to lend to you again. The early loan payoff will stay on your credit report, and every bank will be able to see what happened. If you try to get an owner-occupied loan on a house flip that you never intended to live in, you are committing fraud. The banks will see you sold the property right away, and while they may not pursue any criminal charges against you, they most likely will not lend to you again. When flipping houses, you need to get short-term loans if you want to create a business and not be a one-hit wonder. There are many different kinds of short-term financing. Hard money, private money, and portfolio money can all be used in the short-term. Short-term financing is usually much more expensive than long-term financing because it is considered riskier and there is a much shorter period of interest collection. Most banks will not lend on house flips, especially the big banks, but some smaller banks will. They offer one-year loans that are specifically meant for house flippers. Hard-money loans are also short-term loans made for house flippers. Private money is money you borrow from regular people and can have many varying terms. Hard-money lenders provide short-term financing over one or two years at the most. Hard-money lenders can have very flexible terms but are also very expensive. A hard-money lender typically charges between 8 and 14% interest and 2 to 5 points. One point is equal to one percent and is charged on the loan amount. Many times, the hard-money lender will not charge those points to the flipper until the house is sold and the loan is paid off. Hard-money lenders are not banks but investment companies. They borrow money from other investors at a lower rate than they lend to house flippers. They are not bound by many of the regulations that banks are bound by, but they still have rules they must adhere to. Hard-money loans cannot be used on owner-occupied houses, only investment properties. The great thing about hard-money loans is they allow someone to buy a property with less money down than bank loans. You can base the loan off the value of the home after repairs are made. With other loans, you have to base the loan off of the purchase price. If I were to buy a house for $75,000, but it is worth $150,000 after it is repaired, the hard-money lender would base the loan amount off the repaired value. That means I could potentially finance the entire purchase price plus some of the repairs. Here is an example of a hard-money loan that will finance 65% of the ARV (after repaired value) of a home. However, most hard-money lenders like to see some skin in the game from their investors. That means they don’t want to lend 100% of the costs needed because they borrower has less incentive to make the deal work if something goes wrong. 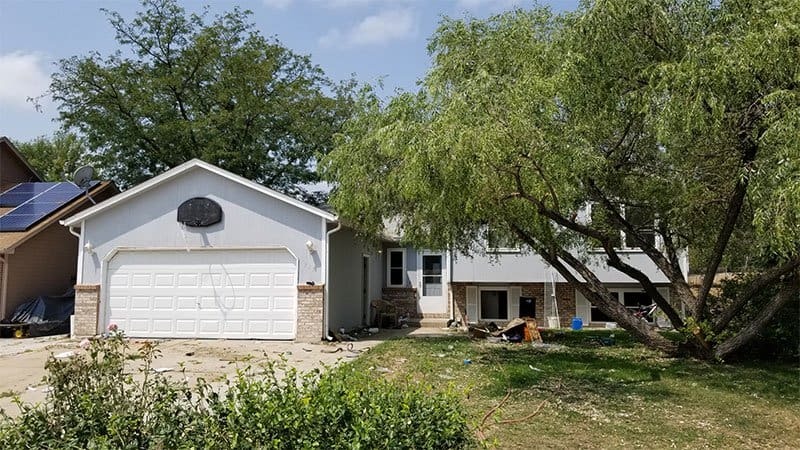 The costs involved with this hard-money loan would be $3,900 for the 4 points and $6,825 for the interest if it was 14% over 6 months. The hard-money lender may also have appraisals and other fees that need to be considered. The hard-money lenders that will cover all the costs will charge the highest rates and the most points. Why do investors choose to use hard money? The reason investors are willing to pay such high rates on a hard-money loan is that they have no other choice. It is very hard to get short-term financing from most banks, and that is what hard money is for. You can get lower rates with a bank, but you will be paying for the repairs and up to a 25% down payment out of your pocket. Financing more of the deal comes with a higher cost. How much does a hard-money lender charge? Finding a hard-money lender is not a difficult task. A Google search for hard-money lenders will turn up about 1,000 results. The tough part is finding a hard-money lender that has reasonable rates, lends in your local market, and is experienced. Many hard-money lenders charge over 15%, and many others cannot perform when a deal is on the line. I am a real estate broker as well as an investor, and I have seen multiple deals fall through because a hard-money lender dropped the ball. Luckily many larger hard-money lenders have popped up in the last decade. It is much easier to find a reputable hard-money lender than it used to be. There are also a ton of companies that call themselves hard-money lenders, and most do very little lending. Most hard-money lenders are also localized to one state or even one area of a state where they know the market. However, there are some larger hard-money lenders that work in many states and have lower rates than a typical hard-money lender may have. While many of the smaller hard-money lenders will charge 15% or more, there are larger companies that are more affordable. The reason these companies can charge less to the real estate investors is that they are getting their money from large hedge funds who do not require as high of a return as the smaller individual investor. Many of the larger hard-money lenders will have rates as low as 8% with 2 to 4 points. If you prefer to work with a local hard-money lender, I would be very careful who you deal with. Referrals are always the best way to find reputable business partners. Here are a few ways to find some hard-money lenders. Ask around at a local real estate investor meetup. Many times, hard-money lenders will sponsor and speak at the meetings. Ask your real estate agent or a lender if they know of any hard-money lenders. There is a good chance they may not know any, but it does not hurt to ask. Check with online real estate investing communities. Search online, but be very careful! Recently, one of our buyers was using a hard-money lender on a HUD deal, and they could not provide a proof of funds to show they had money to lend the buyer. If you are looking for cheaper hard money from larger, national companies I have a list of some I know that are legit. I have used a couple of them myself. I prefer private money or bank money, but hard money can be a viable option for many investors. The more deals you have done, the better rates and terms you can get. Here are some more hard-money lenders who I know are legit. I use private money to finance a portion of my fix and flips. I get private money from family members and other investors I know. I use that money to help pay for down payments, repairs, and the houses themselves. Private money is a loan or investment from friends, family, coworkers, or investors. The loan is typically based on personal relationships and trust. Finding private money usually involves finding family or friends who are willing to lend you money in return for a higher interest rate than they could get from a CD or bank. Many hard-money lenders will call themselves private-money lenders. They do this as a marketing ploy because many new investors believe private money is the key to their real estate investing business. Do not be tricked and fall for private-money scams, which I will talk about shortly. True private money comes from people who have a lot of cash and are willing to lend it to individual investors. Private money can come from friends, family, business partners, other real estate investors. or anyone with cash. Asking for private money is not easy, and finding people with money who are willing to lend it to individuals is difficult. Private money rates can vary from 0% (most likely a parent wanting to help their children) to 12% or higher. The rates all depend on what return the lender wants, what the investor is willing to pay, and the risk involved. Why do investors choose to use private money? I use a mix of financing when I flip houses. I have up to 22 flips going at the once, and in order to do that many flips, I must have a lot of financing in place. When I flip houses, I usually pay from $150,000 to $250,000 for a house. After I pay for the down payment and repairs, I usually have at least $75,000 in cash I need after using the bank financing on each flip. If I have 10 flips, I would need $750,000 minimum of my own cash invested to complete the flips. The truth is many of my flips need $50,000 in repairs alone. By using private money and lines of credit, I can flip more houses and make more money, even though the financing costs are higher than the bank. Some flippers will use only private money to fund their flipping business. When buying at a foreclosure auction, you may need cash within a couple of hours of winning the bid. Most banks or hard-money lenders cannot fund that quickly. Private-money lenders can fund deals right away and will have more flexible terms than most banks and hard-money lenders. Banks and hard-money lenders will have certain guidelines they will lend on for flips. They will not want to lend over a certain amount of the purchase price or the after repaired value. Some private-money lenders will lend on the entire purchase price and all the repairs. When I want to use my private money, I simply send a text or email to the lender I want to use, tell them about the deal, and usually have a confirmation they can do the deal that same day as long as they have money available. How do you find a private-money lender? Private money is very important to growing a flipping business, but it is not easy to find. Here are the most common roadblocks to finding private money. Investors do not want to ask their friends or family because they are afraid of rejection or losing their money. Investors do not know anyone with a lot of cash who could be a private-money lender. Investors do not have any experience flipping houses, and private-money lenders do not want to lend to them. If you are afraid of rejection, you are in the wrong business. It happens all the time in real estate, so don’t worry about people saying no. It is not the end of the world. As for being afraid of losing money from people you know, you should also be worried about losing money from people you don’t know! If you don’t have confidence you can make money, maybe you need more education and experience. If you don’t know anyone with a lot of cash, there are ways to find those people. First off, you may know people with cash but have not thought about them or are afraid to ask them. Make a list of everyone you know and anyone they know or may have connections with who might have money. If you have never flipped a house, it is tough to get started. The best way to get attention from lenders is to find awesome deals. Find a deal that is so good that it is a no-brainer for the lender. Even if you screw up and can’t pay back the loan, the lender could take the house back and still be in a good position. If you went through all your contacts and still cannot find someone with money, you have more options. There are investors lending flippers money all the time and most likely doing it in your market. How do you find those lenders? When someone gets a private-money loan, a Deed of Trust is used to record the loan against the property. When a Deed of Trust is recorded against a property, it becomes public record, and anyone can see who the lender was. Look for properties that have been flipped (either sold recently or on the market) and check public records for private-money loans. As a real estate agent, I can look up public records on properties very easily and see what loans are against a property. If I want to see the actual Deed of Trust, I can use the county’s website or call the title company and ask for a copy. You can also use List Source to find properties with private-money loans against them. With this technique, you can find investors who are lending to flippers in your market. Finding investors who will lend money is just the first part of the process. There are a ton of scams going around involving private-money loans. The scam works by someone pretending to be a private-money lender and offering a very cheap interest rate like 5%. They claim the loan could be as much as $20,000,000 and fund in 5 days. They don’t do a credit check or care about bankruptcies. When they get someone interested in the loan, they claim they need an application fee. The fee could be $50 or $500. Once the fee is paid, the potential borrower will never hear from the private lender again. It is pretty easy to spot a private-money scam. The terms seem too good to be true with a low-interest rate and huge amounts of money they are willing to lend. People with that much money do not lend it to strangers at super-low interest rates. They also want you to send an application fee to get started. They do not want you to send it through a credit card or PayPal because they know you can reverse those charges when you find out it is a scam. Most of these lenders show up on Facebook, especially in real estate groups. You can also spot a fake lender because their Facebook account was recently created and they have no friends. It is pretty obvious when the lender is fake, but people still fall for it. A portfolio lender is a local bank that lends their own money to investors. Most big makes create mortgages and then sell those mortgages on the secondary market. Even some hard-money lenders will sell their loans on the secondary market. The lenders who sell their loans much abide by very strict guidelines. Portfolio lenders do not sell their loans and have much more leniency when lending. You will see a wide array of lending options with local banks because there are no set guidelines. How much does a portfolio lender charge? My portfolio lender lends me up to 75% of the purchase price on my flips. I have to come up with the down payment and money to pay for repairs with this loan. I have to put more money into a flip with a portfolio loan, but the interest rate is lower than a hard-money loan. I pay 5.25% with 1.5 points on my loans with a few local banks. My lender can complete a loan in two weeks, and no appraisal is needed on loans less than $150,000. Even though I am using financing to buy flips, I write the offer as a cash deal. The market is very competitive, and a cash offer is usually much more attractive to a seller. I am able to offer cash because I do not include any loan conditions or appraisal contingency in my offer. If I have to pay cash, I can, but I can buy many more properties by getting a loan. I write into the contract that I may use a private or local bank loan, but I can pay cash if needed. The terms for banks can vary greatly. I know of some investors who have local banks that will finance the repairs while mine will not. I know investors who are still getting lines of credit with banks for house flips without much collateral, while mine will not. Before the housing crisis, we had an $800,000 line of credit with a local bank that was unsecured except for the houses that we bought to flip. Those lines of credit disappeared after the market imploded and many banks went under, even though we did just fine and never missed a payment. How do you find a portfolio lender? The tricky part of using local banks to finance flips is not all of them do it. Most big banks will not even think about financing a flip, and many small banks will not touch them either. If you do find a small bank that will finance flips, they usually only want to work with experienced investors. It is tough for a brand-new flipper to get started with a bank until they have a deal under their belt. You find a local bank by asking around; title companies, investors, agents, other lenders. You also can cold call local banks, but be prepared to be told no many times. You might even be told by one person in the bank, only to have another say yes. It takes persistence and hard work to find great financing for flips. Crowdfunding is when many investors group together to invest in one project. Each investor can put as little as $5,000 into a project. A crowdfunding company will find the investors, find the projects to invest in, and take a cut of the money. Crowdfunding is much like hard money as far as the rates and terms for the house flipper looking to get a loan. Actually, I believe hard money has become cheaper in the last year or two, which has led to the downfall of crowdfunding for house flipping. What’s Their Strategy? – Each platform has a business model and strategy that drives the types of deals they fund. You should be able to get a good understanding of this from their website and the deals they have already funded. If their business model is not built to help you achieve your goals, it will likely be a waste of your time trying to work with them unless you can modify your strategy to fit theirs. They likely have an investor base and underwriting model set up to partner with a certain type of developer and their deals. If your deals don’t fit into that target, they will be less likely to want to work with you. What are their Underwriting Requirements? – You should also be able to get a good understanding of this by reviewing their past deals. You should also give them a call if you are unsure and ask if they can share with you their underwriting requirements. Most platforms out there today want the developer to contribute some equity to the deal. If you don’t have enough capital to put into each of your deals, they may not be able to help you. Are they in it for the Long-term? – This question has several aspects. The first goes to their strategy. Can you reasonably believe that a year from now your business model will still align with theirs? Is funding residential fix-and-flip properties an asset class they plan on offering for the foreseeable future? If not, you may not want to invest your time developing a relationship with them. The second question you should ask is whether you think this company will still be in business a year from now. This is a new industry with companies popping up every week. Take some time to get to know their management team to better understand if you believe there will be an ongoing concern. Deciding to use crowdfunding as a source for capital should be approached with some thought and consideration. Developing a strategy will help you maximize your return on the time you will inevitably need to invest to take advantage of this new and exciting development in the real estate investing world. Why do investors choose to use crowdfunding? Fewer investors are using crowdfunding than in the past. In fact, one real estate crowdfunding site recently went out of business. I think the problem is that hard money is getting cheaper, and it is tough for crowdfunding sites to lower their prices. It can take longer to get a crowdfunding project approved and funded than a hard-money lender would take. If they are more expensive than hard money, there is not much incentive to use them, at least on flips. There are crowdfunding projects for large commercial and rental property developments that may make more sense as hard-money lenders may not be willing to do those. How much does a crowdfunding platform charge? Crowdfunding sites will usually charge at least 10% interested a couple of points for to the investor. The riskier the deal is the more money they will charge. The rates used to be higher, but they have had to reduce those to compete with hard-money lenders. Another option for flippers is to use the equity in real estate they already have. I have refinanced my personal house and multiple rental properties in order to get cash for new rental properties or fix and flips. If you have equity in your personal residence, you can borrow up to 95 percent of the value with some banks either in the form of a line of credit or a refinance. The refinance will be more expensive but will be long term. The line of credit will be cheaper but with a shorter term and usually with a higher variable rate. What do you need to qualify for refinancing? Qualifying for a line of credit is just like qualifying for a regular mortgage. The bank will want to see a good credit score and income to back up the loan amount. Each bank will have different requirements on what exactly they will require. You also must have equity in your home. Equity is the difference between what your home is worth and what you owe against your home currently. Banks will have different loan to value ratios they will allow, and it varies on what type of property you own as well—investment or personal residence. The home equity line of credit on my house has a variable rate that is 2% above the Wall Street Journal prime rate with a floor of 5% and a max of 21%. Right now the rate is 5.25%, and I was able to go up to a 90% loan to value ratio on my primary residence. I am charged no monthly or annual fees, and I only pay interest on money I use from the home equity line of credit. The reason it was so cheap is there was no appraisal required. The lender used one of their models to value my home, and it was completely free. If I thought the bank’s valuation was too low, I could have ordered an appraisal and hoped it came in higher. My only costs were recording fees, flood certification, and title fee. The home equity line of credit is good for five years, and all payments come directly out of my checking account with my portfolio lender. The minimum payments are interest only, but I can pay off as much as I want at any time. Big banks will be happy to give lines of credit on personal houses, but they rarely will do it on investment properties. You will most likely need to find a local portfolio lender to get a line of credit against an investment property. My bank considers this a business line of credit, and the terms are a little different from your personal residence. The bank can still use their valuation system and do not require an appraisal. However, I checked the values on all of my properties, and all the values came in very low. I think this may be because I bought the homes within the last couple of years for much less than they are worth now. The terms are also different for business lines of credit. The bank will only offer a three-year term on the investment property with a maximum 75% loan to value ratio. The rate will be Prime + 2, with a floor rate of 2%. Fees are typically 1% origination plus any applicable 3rd party fee (i.e. title, filing, flood, appraisal). The HELOC on the investment property is definitely more expensive than the personal residence. These numbers are for my local bank. Other banks may have different rates. My bank also requires a one-year seasoning period, which means they will base their loan amount on the last sales price, not the appraisal if the home was purchased within the last year. If you do get a business or personal line of credit, it will most likely count as a debt against you, even if you aren’t using the money. A line of credit may cause your debt to income ratio to rise to a level where most banks will not feel comfortable loaning you money. If you are considering a line of credit but are worried about your debt to income ratio, please talk to your lender first. They can run the numbers and make sure the line of credit won’t cause more harm than good. A home equity line of credit gives a real estate investor a great deal of flexibility no matter what kind of investing they do. 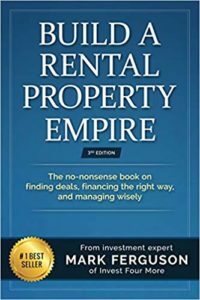 I do a lot of flipping as well as investing in long-term rentals. Lines of credit allow investors access cash to make repairs, buy properties, or cover carrying costs. Having enough available cash can be the difference between success and failure for a real estate investor. A refinance can be used much the same way but will be a longer-term loan with steadier rates. There will usually be higher costs associated with refinancing, and you cannot pay it back and then borrow from it again like you can with a line of credit. There are many ways to finance flips, but that does not mean it is easy to get financing for flips. It is possible to flip houses with little to no money, but that is even harder. The key to getting financing is knowing what you are doing and being able to show your lenders that you know what you are doing as well. I wrote a book on flipping that goes over everything we do…from buying, selling, financing, repairing, and selling the properties. 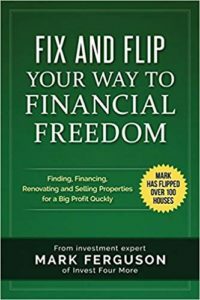 You can find it on Amazon: Fix and Flip Your Way to Financial Freedom.